Ever since he started the Festival of Fools with Burlington City Arts six years ago, artistic director Woody Keppel has wanted to book Big Nazo, an internationally touring, larger-than-life “mutant puppet” tribe. “This is the year that we made it happen,” Keppel says. 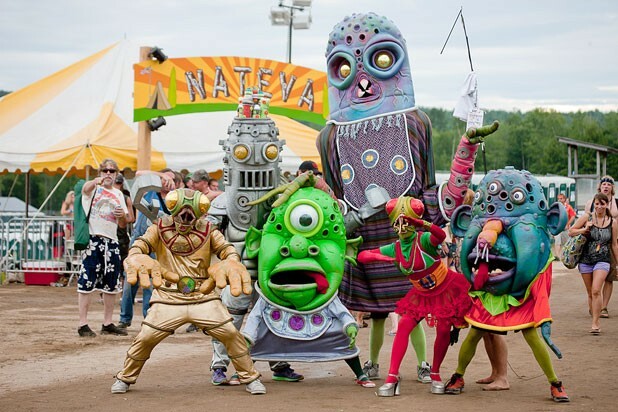 The Providence, R.I.-based troupe is made up of musicians, comedians and dancers who create and don enormous, alien-inspired wearable sculptures. They’ve performed around the world and constructed characters for countless stage performances, TV shows and festivals. In 2010, the troupe held daily parades at the Vancouver Winter Olympics. Keppel, a vaudeville performer and actor, met Erminio Pinque, Big Nazo’s founder and artistic director, about 20 years ago at one of the first International Busker festivals, in Halifax, N.S. “He’s just a phenomenal artist,” Keppel says. With the help of Mayor Miro Weinberger, Big Nazo kicks off the “Spectacle of Fools” opening gala outside city hall at 5:30 p.m. on Friday, followed by a dance party, more performances and, at dusk, an outdoor screening of Buster Keaton’s The Cameraman with a live, original score by local composer Randal Pierce. The rest of the weekend is packed with outdoor acts. Want to watch a guy play classical music by bouncing balls on piano keys? Dan Menendez the Piano Juggler is your man. Looking for an athletic mix of acrobatics, dance and physical comedy? Don’t miss the New York-based dance trio Galumpha. After hours, head to the Starlight Lounge, on the top block of Church Street, where Spielpalast Cabaret’s Phinneus Sonin has curated a strictly local vaudeville show. Other highlights include Saturday’s St. Paul Street block party, with food and beer from American Flatbread and music by Vermont Joy Parade. Burlingtonians might prefer more casual attire, but for the last five years they’ve embraced the Festival of Fools. “I’ve always thought Vermont audiences were some of the best,” says Keppel.